These permanent magnet motors are specifically designed for high torque/low speed applications, offering more power for jobs like stone setting, wax modeling, and pearl drilling. 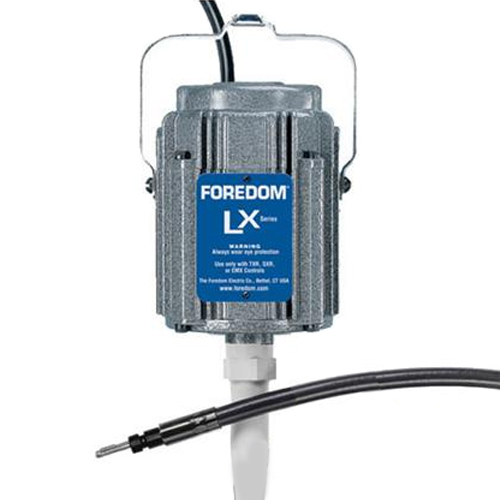 The LX is a 1/10 HP, ball bearing motor featuring full power and torque from start up and throughout the entire speed range up to 5,000 rpm. It is ideal for use with the Foredom drill press. It is also well matched with the #15 and #15D Hammer Handpieces. Comes equipped with a standard 39" long key tip inner shaft and special/more flexible neoprene outer protective sheath for connecting to any Foredom handpiece (except H series). Two year manufacturer's warranty. Available in 115 or 230V.